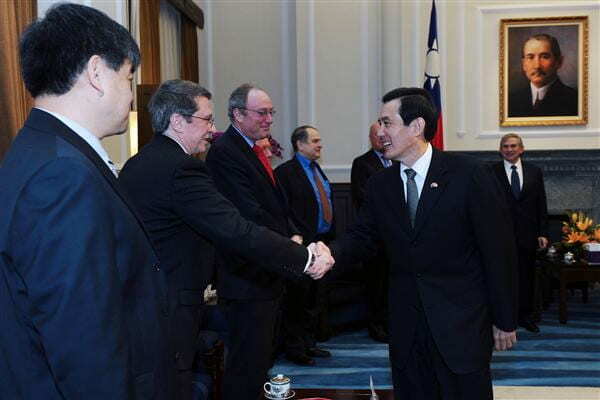 Taiwan Education and Research Program Director, Edward McCord, meets with President Ma Ying-jeou the morning after Taiwan’s 2012 presidential elections. The Taiwan Education and Research Program was established in 2004 to promote and support both academic and policy-related study and research on the history, international relations, and the contemporary political, economic and social development of Taiwan. One primary and continuing goal of the Taiwan Education and Research Program has been the creation and support of the Taiwan Resource Center at the George Washington University’s Gelman Library. The Program also sponsors a seminar series, the Taiwan Forum, organized in 2007 to promote discussion on current Taiwan affairs. Finally the Program collaborates with the Sigur Center to bring other Taiwan- related programming to the GW campus. The Taiwan Education and Research Program operates under the Sigur Center for Asian Studies at The George Washington University’s Elliott School of International Affairs. The program is directed by Edward A. McCord, Associate Professor of History and International Affairs. For comments on or inquiries or inquiries about the Taiwan Education and Research Program, please contact Edward A. McCord at mccord@gwu.edu.